At our Lotus Sutra class today we were discussing the huge problems associated with the translation of this sutra. We know it was originally written in several versions in Sanskrit, little of which is available to us today. We know it was translated into Chinese over 5 centuries after the Buddha’s passing. This presents several challenges. Sanskrit is a word-based language, grammatically similar to the Romance languages, like Latin, French and Spanish. Chinese relies on less precise ideograms or symbolic images. It is more related to Japanese, Korean and other ideogram languages. We also know that the Chinese translators didn’t approach the task as we would. There concern seems to be to capture the teaching spirit rather than a word-for-word approach we use in the modern West. Now, it has been translated from that into several generations of English. This means going back from an ideogram language to a word-based language, and where the language references are probably a millennium apart. We have to keep a very flexible and open mind when we study sutra like this. It was never intended to be read as “the word of God”, so we have to have to allow for a range of meanings and form a learning relationship with it, rather than trying to decipher its precise meaning. Here is the early afternoon talk I delivered at the retreat this weekend. Each of us has our own routine of practice which may include sitting practice, walking practice, study, recitation and so on. These are activities where we set aside a short period of time perhaps once, perhaps twice in a day. We may do this daily or several times a week. This afternoon we have decided to dedicate an extended period of time for practice. As with any kind of activity, giving over an intensive block of time will always produce an enrichment of our practice capacity. This is not to say that we become “better” at meditation, since ours is a practice of non-judgment. It’s more that, through this kind of retreat practice, we deepen the groove of our practice to allow us greater facility in any future practice. In my earlier meditation career, which took place within the disciplines of Soto Zen, we would regularly set aside such time and refer to it as sesshin. This expression is built around the Buddhist term shin which is one of several words that direct us at the heart, that intimate center of our being. Participating in such an event encouraged us to become intimate with ourselves, that is, to let go of the usual boundaries, limitations or structures that we maintained to preserve a fixed identity. It also suggested intimacy in the sense of love and affection. It was a time for us to practice compassion, loving kindness and sympathetic joy for our fellow retreatants, but also for ourselves. The expression self-care is somewhat trivialized in modern life, but retreat experience is just that, the opportunity to care about and care for ourselves. For the remainder of our retreat time this afternoon I encourage each of us to bring that spirit of self-care to this activity. Any moment of practice as well as any extended practice such as this calls us to intimacy. We are not here to bully ourselves, to feel sorry or afraid for ourselves. We are not here to acquire some secret wisdom. In retreat there is nothing to prove, no opportunity for either success or failure. As with any more mundane social experience, say lunch with a friend, we need not judge or evaluate, we need not set goals or objectives. We only need to attend and participate fully. For the remainder of this first half of the retreat I recommend that you begin with accepting yourself exactly as you find yourself. Notice the tendency to set expectations and performance standards, as if someone will deliver you a certificate of excellence at the conclusion. Notice the tendency towards self criticism, with judgments, evaluations and comparisons. None of this is necessary or helpful. When we engage in any reflective process both the tools and the raw materials are the same, our own experience. We can’t get better ones, we can only refine what we have. Therefore, we begin where we are, as we are. Please enjoy this time. Every year, in this 3rd week of November practice, we hold a Memorial Service. This is the opportunity we reserve to reflect on the guiding lives which have ended in the past year or so. In Asian culture, this remembering is instrumental in contributing to the afterlife of parents and grandparents, the whole of the family line. In our practice, we broaden that out to consider all beings, human and animal who have contributed to us in the past year and whose lives have ended. In doing this we recall the deep connections and involvement we have with so many other lives. We remind ourselves of the impact of those we know and the countless we do not know by name. In particular I express our concern at the present health of our Dharma brother, Thich Nhat Hahn. This Vietnamese Zen monk has touched so many lives and he is one of the most iconic of post-Viet Nam War Buddhist people. He has been a key figure in my work on contemplative walking, being one of the few who has taken movement practices seriously. He has also been a giant in promoting mindfulness practice outside the Buddhist community. Latest news from his community, Plum Village in France, says the 88 year old Thay, as they call him, is in hospital and doing well. May you know peace, may you know wellness. Buddhism is founded on the acknowledgment that there is no enduring self. We might then wonder, how can there be memories if there is no permanent self. This is addressed in classical Buddhist psychology by the assertion of what are called vasanas (mind seeds or habit-energy). These are subtle impressions which are deposited on the transient states of mind by actions and which lie dormant, like seeds. They may disappear or they may come to fruition by stimulating mental activity which leads to more action. Both the very subtle arising in the mind and the more concrete arising of actions have karmic consequences. Therefore, memories themselves have a karmic force, albeit rather light and subtle. These are retained and stored up in “storehouse consciousness” (Alayavijana) as a sort of latent energy ready to be set in motion. Vasana has the power of perfuming energies (don’t you just love that term “perfuming”?). This perfuming or leaving impressions is sometimes known as sowing seeds. 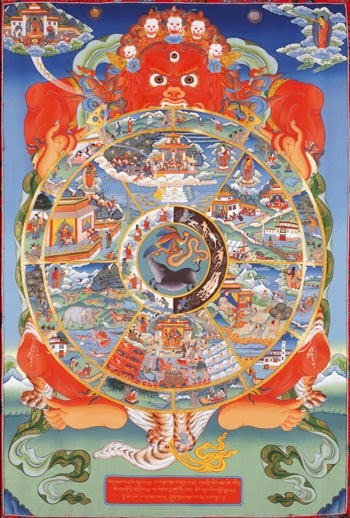 Since the beginningless past, sentient beings have created this energy through inappropriate dualistic discrimination. Memories are conceived differently than in our Western psychology. Western theory especially in this computer age, tends to describe human memory as if it were similar to a CD or hard drive. We imagine thoughts, events, information as somehow being stored, in a more or less accurate manner. What we bring forth in memory is seen as having some representative value. Like pulling up a file on the screen, as it were. It is conceived as being fairly stable over time, so that we can talk about “recovering” memories, which are taken to be actual records of experience, which may be decades old. Interestingly, modern psychology is demonstrating that memory is less accurate than we had imagined. We are learning that human memory changes with time and need. People will “remember” events which never happened to them if there is a strong need to associate identity with some facts as if they were experienced. Unlike Buddhist theory, we see memory as mostly neutral, more like a record of experience, free of momentum, and giving us data upon which we may or may not act. In Buddhist mind theory, memory seeds have potential for motivation and drive. They are like stored charges which can propel us to act in some way. As we begin November, we return for our annual month of remembrance. In the Upajjhatthana Sutta (Sutra of Contemplations) we are advised to remember these five facts on a daily basis. 2. I am vulnerable to becoming ill.
4. All that I claim as mine, beloved and pleasing, will become otherwise, will become separated from me. 5. I am a karmic being; whatever I do, for good or for ill, I will experience the “fruits”. None of this is news, but it bears re-considering and probably bears doing so daily. These are the facts of life, as it were. For some, as has been a frequent interpretation by other traditions, is that this is pessimistic, hopeless - a real downer. That remains a complete misinterpretation and faulty judgment of buddhadharma. As we are learning from our current study of the Lotus Sutra, humans are not faced with a hopeless desperate situation. We are embedded in a condition with limits. The message of the Buddha is that we can transcend these limits through a combination of our efforts and the unceasing efforts of Buddhas and Bodhisattvas. In fact, we are promised a certain liberation. This guarantee begins with our realization of the five remembrances. I earn my livelihood as a health professional and this health field has healing as its purpose. We're told that the words heal and whole are related and the healing arts and sciences strive to make us whole again.I hear people talk about dharma practice or mindfulness as "healing work" too, but I wonder if that's really what we're doing. In Japanese Dharma, we use the term hongaku which means "original enlightenment". It proposes that our spiritual challenge is one of recognizing or, as we say, realizing that we have always been and always will be not-different from the 10,000 Buddhas. We have not lost anything, we are not incomplete, broken, sick or corrupted. Our human life is constructed from our mistaking this realm as in some way permanent. It is this mis-apprehension which brings about our suffering. So, what will bring us relief is insight and not some act of healing. We are not ill or broken, so we do not need healing or wholing. When we slide into the language of healing and look for ways to respond, we reinforce the idea that something happened, and our prior wholeness has been compromised, we became un-healthy. This also reinforces a view of ourselves as diminished, as dis-eased - "we're just not ourselves these days". As I take it, the Dharma message is different from such an illness or un-whole one. We are already full and complete, there is nothing out of place, dis-eased or incomplete. Even our lives within the conditioned realm of birth and death is a possible way to be. Its just that it comes with the consequences of suffering and death. In short, we are not being called by the Buddhas to "heal ourselves" but to realize our Buddha-nature.